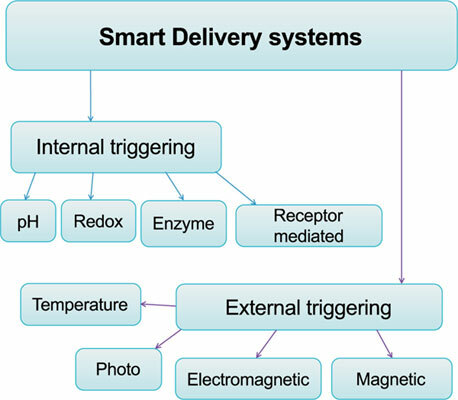 Background: Smart triggered release in controlled drug delivery has met an astonishing interest from the scientific community in the past few years due to the obvious medical benefits this type of systems represents. The reduction in toxicity due to a non-systemic administration is not the only reason for this increase, although it is a major reason for concern typically in anti-cancer therapy, but also the fact that some good therapeutic substances cannot be used either due to their high hydrophobicity or due to a very poor absorption at the required site of delivery. Objective: This review article aims to highlight the efforts made by the scientific community in order to more efficiently trigger the drug payload at its destination, thus avoiding systemic exposure to the drug's toxic effect. Results: In this review article several types of triggers have been evaluated, pH triggered delivery, thermally triggered delivery, REDOX change triggered delivery, as well as modifications made to trigger at a specific location based on the affinity of the receptors for a certain chemical moiety, such as folic acid. Conclusions: Through a proper nano-formulation the obstacles encountered by systemic delivery strategies can be circumvented, and through minor modifications hydrophobic drugs can be delivered through minor modifications to their structure, ensuring in the meantime that the therapeutic form is broken down by the human body’s own internal systems. The main advantages in triggered drug delivery are the better healthcare strategy and the topical delivery, the main person winning in this case being the patient, the one person that should always be at the heart of the medical system. Magnetic nanoparticles, drug delivery, MRI, triggered release, pH triggered delivery, thermally triggered delivery.